(October 29, Colombo, Sri Lanka Guardian) The Defence Ministry website in its news titled ‘Defence Authorities Poo-Pooh concocted web stories and email campaign’ vaguely repudiated the claim of this column that LTTE leader V Pirabakaran was tortured and killed by the army. In its usual intimidating and threatening tone, the Defence Ministtry website said the authorities ‘are planning prosecution against those publishers in accordance with legal provisions that have already been published’. Similar legal threat was publicly made against the Channel 4 news for showing government soldiers executing young Tamils during the war. This column revealed the claim of wrong doing in the death of Pirabakaran and is making further investigations to verify and confirm the statement. More facts are coming to light and we shall publish them once they are duly verified. Since publication of the news, further information has been obtained about the location where Pirabkaran was brutally executed and that his brutal killing had the sanctions of the bigwigs of the government and the military hierarchy. In addition to the claims published in the Sri Lanka Guardian, there are compelling and circumstantial evidence available that Pirabakaran was not killed in a direct military confrontation and foul play had taken place to end his life. The above awful/gruesome picture of the dead body of Pirabkaran deliberately released by the Defence Ministry immediately after his death to prop up ecstatic feelings in the country, speaks the scale of the violence perpetrated on him. No forensic experts will say the injury was caused by the sniper bullet/s-the well publicised claim of the government. The injury visibly shows a sharp instrument (i.e. chopping devise) being used on Pirabakaran. This compelling circumstantial evidence, concur with our revelation that Pirabakaran was butchered. The government has not provided details of the post-mortem report of Pirabakaran supported by forensic evidence to confirm the cause of his death. 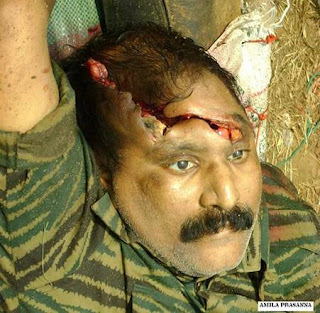 The above picture is the bullets riddled body of Pirabakaran’s youngest son Balachandran. Unlike the government claim of his father being killed by the sniper bullets, the bullets fired on the son did not cause deep cutting wounds like on the father’s head. 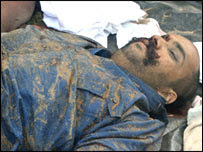 This is the picture of the dead body of Pirabakaran’s eldest son Charles Anthony. He died of a gun shot injury to his right eye. His body too is not showing any deep cut injury like the father. It is important that any post war investigation war crimes committed by both the government forces and the LTTE and must consider the real causes that created Pirabakaran in the first place and also the full circumstances of his death which the government in its usual frenzy is arrogantly preventing any probe. What else do you expect the Army to do when they capture a barbaric killer who murdered innocent children by thousands. Take him to a five star hotel? You are very sympathetic since it did not happen to you.